In order to become a member of the National Capital Area Chapter, you must first become a member of the National organization. Listed below are the benefits of joining ASPA. Already a member? Member-only login content coming soon. Check back in this spot for future options! 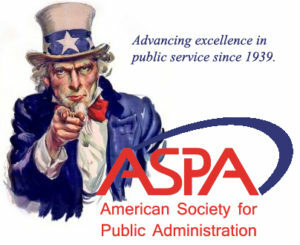 The American Society for Public Administration (ASPA) is committed to the advancement of excellence in public service. The Society seeks to achieve that by: the advancement of the science, art, and processes of public administration, the development and exchange of public administration literature and information, and advocacy on behalf of public service and high ethical standards in government. With more than 10,000 members, ASPA represents a broad array of professional interests and disciplines from all levels of government, the nonprofit and private sectors, and the academic community, both in the United States and abroad. ASPA has provided national leadership in the areas of public administration and management since 1939. The Society and its members have been influential in virtually every significant development in the theories and practice of public administration for over a half century. Through its networks of 57 local chapters, 28+ national special-focus sections, individual and agency members, and organizational supporters, ASPA promotes recognition of public service, develops a substantive dialogue on current issues, and enhances the professional development of its membership. Public Administration Review (PAR) – The top journal in public administration and crucial for keeping you current on important topics. PA TIMES – Our monthly newspaper focusing on the concerns of public administrators and highlighting best practices in the field. The Recruiter, is a special employment section in the PA Times and on our Web site. Other publications: Governing magazine, Public Integrity issues, The Public Manager journal, Leadership Insights digest. ASPAnet.org – We keep you informed and provide detailed information on ASPA and public service. We also feature lots of useful tools for PA leadership and lots or resources for students. The Center for Accountability and Performance (CAP) – A special resource for members interested in performance measurement and managing for results, CAP offers case studies, workshops, workbooks, symposia and other educational opportunities. Training & Professional Development in webinars, workshops, and networking locally and online. Public Service Careers through our online career center. Discounts on books, services, and conferences. Annual & Regional conferences around the year. ASPA supports 28+ special interest sections, which provide a forum for administrators working in the same field across the U.S. and around the world. Most sections also offer newsletters, networking, and journals to members, helping to keep them current in their area of expertise. Scroll through our sections below. Don’t see a section of interest? Help start a new section. Volunteer Opportunities – ASPA offers you countless volunteer opportunities in both the organization and the field of public administration. Volunteering with ASPA offers valuable experience and exposure. The Society’s National Conference – ASPA’s 77th national conference was in Seattle, WA this past March 17-22, 2016. The conference provided four days of information, resource and contact gathering while interacting with top scholars, administrators and public managers on a wide variety of session topics. Look for announcements for the 2017 national conference in Atlanta, GA coming soon. Networking Opportunities – Participation in ASPA through its chapters and sections and national and regional conferences will expose you to a vast network of public administration professionals, resources and information. Local Chapter Membership – local chapters provide you the opportunity to attend lectures, conferences and seminars, as well as participate in networking luncheons and award banquets. Chapters also keep members current on what’s happening in their local public administration community. ASPA strives to promote pride and honor in the public service with awards like the National Public Service Award (NPSA), co-sponsored by ASPA and the National Academy of Public Administration (NAPA), established 18 years ago to pay tribute to exemplary public managers and the Charles H. Levine Memorial Award for Excellence in Public Administration, co-sponsored by ASPA and the National Association of Schools of Public Affairs and Administration (NASPAA) which recognizes a public administration faculty member. ASPA also recently established the Elmer B. Staats Lifetime Achievement Award for Distinguished Public Service to honor a public administrators’ career accomplishments and contributions to the public service and ASPA over a lifetime.